If your garage is overflowing or packed to the brim with stuff, perhaps it's time to look at various storage options to get the space organised. As the most convenient place to store items for the garden and home, and also as a storage place for any items that have no particular place to go, the garage can end up being a dumping ground, with hardly room - or perhaps none at all - to park a car! 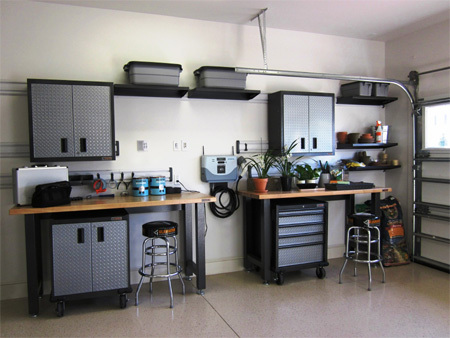 For any homeowner who uses their garage as a workshop, a practical option is to install shelves and cabinets down the side, or at one end of the garage. If space is limited and you can't fit floor cabinets, you could always install a workbench with a flap-down shelf or simply a flap shelf for working on. Alternatively, make yourself a mobile workbench on wheels, so that you can roll it into a corner when not in use. For most households, the garage has become a place to store unwanted stuff. Garden tools stacked in a corner; paint tins piled high against a wall - never mind that the car gets parked outside! 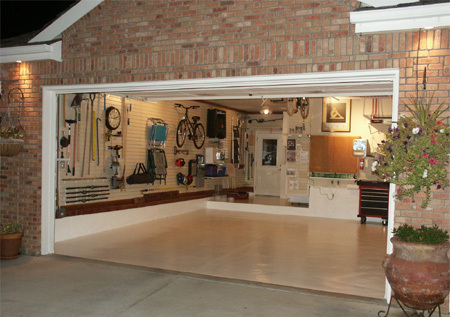 If you plan to get the garage sorted, it's time to bite the proverbial bullet and do it. Start by sorting through what's in there and tossing out anything - larger items - that haven't been used for a long, long time. Chances are you don't need it anymore. If you can organise a skip, or someone to cart away the items, even better - before you have chance to change your mind! 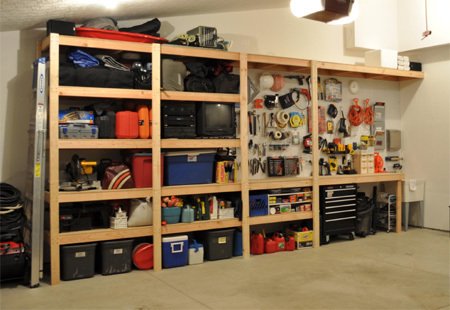 With larger items out of the way you'll have more space to start emptying out the garage. Check the weather report before you start - the last thing you need is for it to start raining whilst everything is outside. Be ruthless - don't cave in once you decide to donate or toss out. If you're donating or selling stuff, organise this in advance so that it can be collected. You can easily sell secondhand goods on Bid or Buy or Gumtree, or in your local classifieds. With the space sorted and cleaned you're ready to start planning for storage and buying or making shelves and cabinets. This is probably one of the easiest and most affordable ways to pack away items that are in regular use. 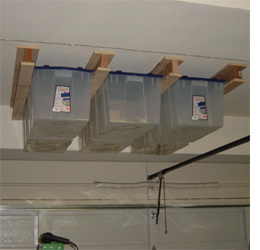 Plastic storage bins fit into DIY brackets that are attached to the ceiling. My only problem with this is that when filled with items, the bins could be quite heavy and difficulty to cart up and down. Best option for items you will probably only use once a year or very rarely. Industrial shelving is another way to hang shelving from the ceiling. Your local Builders Warehouse stock a range of shelving and baskets for interiors that can easily be modified to provide garage storage. Before you consider this option, make sure the roofing is solid and secure, and able to take the weight. Make sure you allow space for items that you use on a regular. 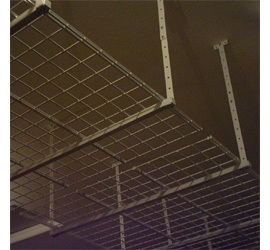 A hanging rack can easily accommodate small garden tools and equipment ,as well as sporting equipment. 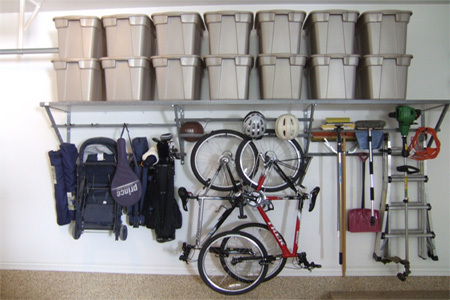 You can add additional organizing areas to your garage by taking advantage of wall space to store tools, hoses and sports equipment. This one is definitely on my 'To Do' list. This cabinet has three compartments that open up to reveal shelves and hanging space for tools and accessories. The added storage boxes allow you to pack away screws and hardware. Close the compartments and you have a compact cabinet that can be moved anywhere. 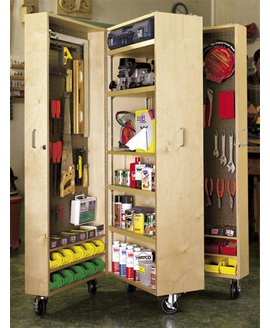 Click here for instructions to make this mobile compartment cabinet. In a garage that offers little space for anything else but a car, a narrow floor-to-ceiling shelving unit is probably the easiest and most practical option to consider. This system allows easy access to everything being stored and takes up very little floor space. Built-in cupboards can be used to organise a garage just as they are used to organise your clothes. It's a nice way to store and have everything look neat and tidy at the same time. 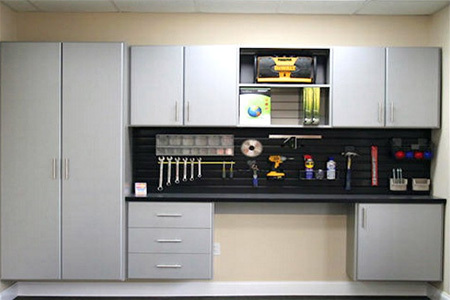 You can purchase ready-made stock cabinets - with or without doors - and then custom finish to suit your own requirements. For flammable items, which includes paints, have a lockable cabinet - preferably one that has a ventilation grill - to keep such items safely out of reach of children. 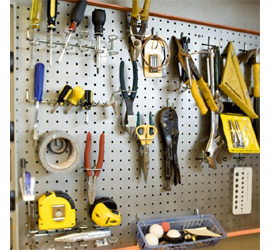 Pegboards are a great and inexpensive way to hang you tools and keep everything in it’s place, but they can look unsightly, especially when not kept organised. Draw outlines of the shape of each tool with a marker to make it easier to remember where each tool goes. 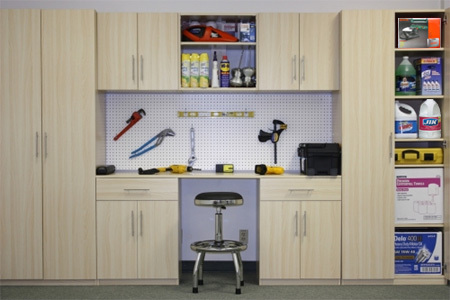 A better option is to incorporate a small pegboard within the main storage area, so that you can have tools handy and easy to get to when you need them.